Copyright (c) 2001-2007 1stWorks Corporation. All rights reserved. Revision 7.0 is a required upgrade, due to the new Timed Camera technology. Why does hotComm have required revisions? hotComm is real-time communication, conferencing and collaboration software. So that all presenters and participants can take advantage of the latest features, all users must have at least the minimum required revision of the software. From time to time, 1stWorks updates the minimum revision requirement. Which product am I using? The basic Timed Camera technology has changed. hotComm still sends the initial image, followed by incremental changes; and the changes are sent at timed intervals; but the process for determining changes is now faster, more efficient, and should use less bandwidth for both presenter and recipient. Because the images are transmitted faster, it should also make it easier to connect and stay connected. The way you use Timed Camera and its features has not changed. The only thing you should notice is increased speed. hotComm sends incremental changes in small rectangles, instead of a full line of data. hotComm treats an existing image being scrolled differently than a new image. Use of a mirror driver for detecting changes. In addition to improvements in the basic Timed Camera technology, this revision introduces the mirror driver technology for presenters. Image changes are determined by comparing screen activity with a mirror copy of the screen, instead of with a saved image. The Mirror Driver is available for hotComm Standard/Pro and hotComm CL for Moderators and Presenters, but not for hotComm Lite. hotComm 7.0 revisions can see images sent without the Mirror Driver, but hotComm 7.0 is required to see images sent with the Mirror Driver. During the installation, when you are ask this question: "Will you present dynamic content from this computer? ", answer Yes, so it installs the Mirror Driver. If you have the Mirror Driver installed (and therefore, available), an "M" icon appears on the bottom line of your hotComm window. An "M" icon appears on the bottom line of your hotComm window. Command line options for the Mirror Driver are below. For instructions on adding a command line parameter, see www.hotcomm.com/faq/faqk30.asp, except add /mdx or -qq instead of -k30. /mdx Do not load the Mirror Driver. -qq Keep the Mirror Driver active until you exit hotComm. As you turn the Timed Camera on and off, you'll get a brief screen flash as it turns the Mirror Driver on and off. With this option, you'll only get a flash the first time you start Timed Camera. Vista note: In Windows Vista, you run a special version of hotComm, the hotComMD.exe executable. When you start this version of hotComm, it launches the hotComm Loader with Run as Administrator to load the Mirror Driver and then start the usual hotComm executable (hotComm.exe) normally. Vista may ask for permission to launch the hotComm Loader. To see the setting on the desktop icon, right-click the icon and select Properties, then click the Advanced button on the Shortcut tab, and you'll see that Run As Administrator is checked. If you ever use hotComm CL for moderating or presenting, please install the hotComm CL for Moderators and Presenters, which includes the Mirror Driver. You can download it from www.hotcomm.com/downloadCLmp.asp. There is a new weblink connection available for hotComm Windows clients, called the !bang link. It is a direct connection, not using Java, that can take advantage of many of the customizable options of the hotComm Java link. If you have a hotComm product installed but not running, clicking the link automatically starts the hotComm product. See Auto-startup. The !bang link can use the same *.htm file as a regular Java link, including parameter assignments. The !bang link does not work with the Java client. You must have a hotComm Windows product installed. For Java clients, use the traditional link. 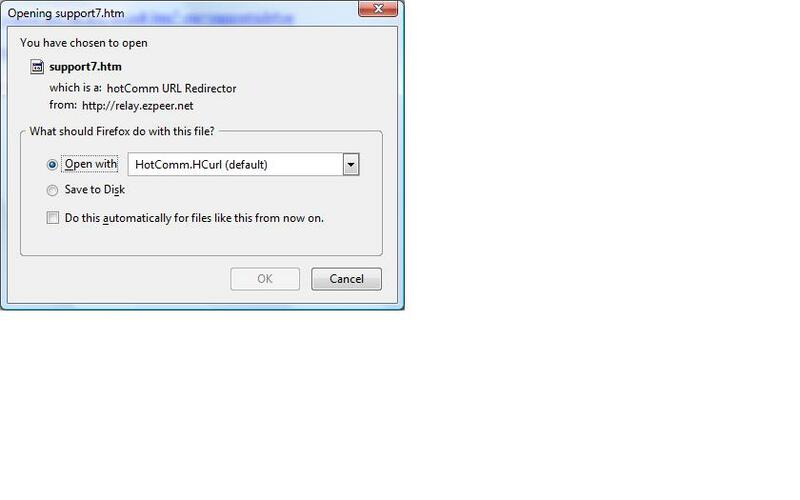 In Windows Vista, you may be prompted to download and open the hotComm.HCurl (default) file, which is identified as a hotComm URL Redirector. We recommend that you check "Do this automatically for files like this from now on" and click OK, in order to avoid being repeatedly prompted for this. When you click a hotComm !bang link, your hotComm client is automatically launched. If you use hotComm Standard/Pro and it is not running when you click the link, the connection process starts automatically, and you're prompted for the room password after hotComm goes online, but you don't join the room until all the Relays in your User List are green. So, you may prefer to start hotComm Standard/Pro before you click the link. hotComm has always included technology to sense whether you are connected or not, and to automatically reconnected you if you lose connection. This technology has been improved. There is a new link parameter that allows you to prohibit typing by any user-level participant, including Java, CL, Lite and Standard/Pro users. Moderators and Presenters are not affected, and can still type. If NOType=1 (typing by users prohibited), the setting cannot be overridden by the Session Control toolbar. The Isolate Users button on the Session Control toolbar now prevents users from seeing other users in the Invited List, but no longer prevents users from seeing typing by other users. You can control the typing with the Keyboard Disable button, which hasn't changed. In revision 6.5 and prior, Isolate Users included both functions. As of revision 6.75, Isolate Users and Keyboard Disable together have the same effect as Isolate Users alone in revision 6.5 and earlier. As of revision 6.75, the Isolate Users button allows Std/Pro, Lite and CL users can see themselves, moderators, presenters, and the "BOT" in the Invited List, but not other users. Java client users do not have any Invited List. hotComm Standard/Pro now shows the type of license you have in the top title bar: hotComm Standard or hotComm Pro. Note that the hotComm Pro label is used for any license of hotComm Presenter Pro or higher. Transcript posts - Moderator and Presenter posts are color-coded dark Blue. Invited List - In the Invited List, Moderators and Presenters are always at the top of the list. Icon - CL Presenters have a Blue and Yellow icon. (Blue C, Yellow L). CL moderators continue to have an all-Blue icon. hotComm CL now exits when you close the chat window. In prior releases, the program stayed resident when you closed the chat window. hotComm CL now includes the Reset Mic & Cams and Close Room options for Moderators. Reset Mic & Cams turns off all the microphones and cameras in the room and resets the room server-side settings. Close Room disconnects everyone and closes the room. Preferences Includes options for the way CL looks and behaves. Session Includes options such as Close This Session, Audio record, Audio Record Timer Setup, and for moderators, Reset Room Sounds and Cams. Help Includes help and support options. Right-click on headset icon Includes options such as Change Identity, Cascade Windows on Primary, Restore and Exit, and more. Moderators have additional room management options on this menu. Right-click on toolbar Includes many of the same options as the Preferences menu. For moderators, includes Room Passwords, Preferences (timed camera settings) and AE Settings. The Microsoft Encoder download and install has been moved from the hotComm Standard/Pro installer to the Session Recording Setup dialog. If the Microsoft Encoder is not installed on your computer, you must install it before making recordings in Windows WMF format. If it is already installed, that dialog does not include a button for installing it. You can install the Microsoft Windows Encoder 9.0 from our site, or from Microsoft. To download from our site, click here: WMEncoder.exe. To change the size of the transcript text, click in the transcript area, press-and-hold your Ctrl key, and press your left-bracket [ or right-bracket ] key until the textsize has become the size you want. If your mouse has a roller-ball between the buttons, you can press-and-hold your Ctrl key, then roll the roller-ball until the text is the size you want. hotComm Lite is now automatically activated when you register. You no longer need to wait for an 8-character activation key to be sent by email. Note: hotComm Standard/Pro still requires the 44-character activation key. Because of the number of people who bought unlock codes for the wrong products, we decided to make the unlock codes interchangeable, to some extent. You can now use a hotComm Lite unlock code in a hotComm Standard product, and you can use a hotComm Standard unlock code in a hotComm Lite product. The number of days you get is adjusted accordingly, because a Standard license costs more than a Lite license. You can also use a hotComm Lite unlock code in a hotComm Pro product, but you get hotComm Standard time, which does not have the same features as hotComm Pro. If you try to use a hotComm Pro unlock code in hotComm Lite, you get a "Product Code Mismatch" error message. As always, new license time adds on to any time remaining on your current license. If you prefer to exchange your unlock code for one for the right product, don't use it -- contact hotComm Support, see www.hotcomm.com/support.asp. ¹ Note: for the correct license used in a product, each month has 31 days. ² Adjustment ratios are set as of May 15, 2007 and may change without notice. Many of the unlock code error messages have been clarified. Issues running hotComm clients under Vista 32-bit have been resolved. You no longer need to selecting Run As Administrator when starting the hotComm Windows clients. The links now work in Internet Explorer, FireFox, Mozilla and Netscape. Internet Explorerer note: when downloading a hotComm installer, start Internet Explorer with the Run As Administrator option. hotComm Loader Starts hotComm or hotComm CL with the Mirror Driver available. Presenters and Moderators should expect this. hotComm.HCurl This is the hotComm URL Redirector, used by the !bang connection link. Anyone connecting with the !bang link on Vista should expect this. Dr. Watson is a utility that provides valuable diagnostic information to engineers in case Windows detects a program error. Vista includes the old version of Dr. Watson that you may remember from Windows 98, but not the very useful drwtsn32 version included in Windows XP. To start Dr. Watson, click Windows Start, in the Search box type run, then in the Run box, type drwatson, and click OK. To find the resulting log, search for drwatson*.log. Note: Vista 64-bit is not officially supported. In order to accomodate changes in Microsoft Windows Vista, hotComm data files are now stored in different locations in Windows Vista and XP. During your first upgrade, existing data files will be moved, so your first installation may be slower than usual. Note that the folders containing these files may be hidden. See Show hidden files. ¹In Windows XP, for hotComm Standard/Pro, you can designate a drive for the program files, and a foldername for program and data files. ²In Windows 2000 and 2003, for hotComm Standard/Pro, you can select a location for all files. Formerly, all hotComm files were stored in the Program Files/1stWorks/ folder. 6. Under Advanced Settings, Hidden Files and Folders, check "Show hidden files and folders"
8. If you want to get out of Classic View, click Control Panel Home (or Switch to Category View) in the left column. The hotComm Mirror Driver is installed automatically in hotComm Std/Pro and hotComm CL on Windows XP, Windows 2000 and Windows 2003. Vista users may need to install manually. It is not included in hotComm Lite. 1. Open Windows Start, then Control Panel, then Device Manager (or Hardware and Sound, then Device Manager). 2. Click Display adaptors. If the Mirror Driver is installed, the list of displaty adapters includes hotComm Mirror Driver. 1. Open Windows Start, then Control Panel, then System (or Switch to Classic View, then System). 2. Click Hardware, then Device Manager. 3. Display adaptors. If the Mirror Driver is installed, the list of displaty adapters includes hotComm Mirror Driver. 1. Open Windows Start, then Control Panel, then Classic View, then Add Hardware. 2. In the Add Hardware wizard, click Next. 3. Select Install the hardware that I manually select from a list (Advanced), and click Next. 4. Select Display Adaptors, and click Next. 5. If the hotComm Mirror Driver is already installed, the Manufacturer list should include 1stWorks; when you click on 1stWorks, the Model list should include hotComm Mirror Driver. If so, click Cancel. 6. If the hotComm Mirror Driver is not already installed, click Have Disk. 7. Click Browse, and navigate to the location where the hotComm Mirror Driver files reside. In most cases, this will be in C://Program Files/1stWorks/yourhotcommproduct/BIN. Select the hcmirror.inf file and click Open, then OK.
8. Click Next, then Next again, then close the Add Hardware Wizard. If you are installing the Mirror Driver on XP, run the hotComm update for your product and that will install the Mirror Driver. During the update, when the installer tells you that you already have the current revision on your computuer, select Continue Anyway. Please report any issues with this revision to support@1stWorks.com.